SAE Youth Victoria in happier times. 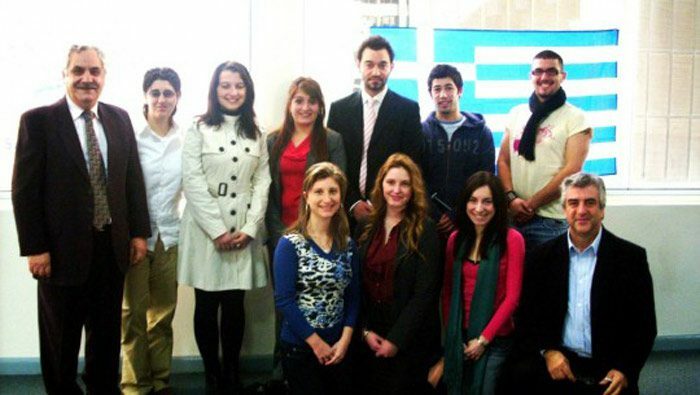 A serious crisis has embroiled the top level of the Youth wing of the World Council for Hellenes Abroad in Victoria which led the President of the branch Emmanuel Lambou to resign from his post last Wednesday. “Due to personal circumstances I am officially resigning effective immediately from my position at SAE. “I am unable to give the position the time and commitment that it needs and feel someone with more time will be able to serve SAE better. “I thank all those that I have worked with for their support and wish everyone well.” However, Neos Kosmos English Edition (NKEE) is aware that the actual reasons for his resignation stem from a dispute that erupted in the ranks of the SAE Youth committee. The dispute quickly turned into a war of words through a chain of emails. What sparked this dispute was an email that Mr Lambou sent to committee members. In his email he took issue with the sending of letters by other committee members in support of the Greek mayor of an Albanian city who was recently jailed for political reasons, and in support of the resolution that was passed by the S.A. Parliament recognising the Pontian Genocide. Mr Lambou was referring to Vasilis Bolanos Mayor of Cheimarra and President of the Omonoia Party that champions the rights of Albania’s Greek minority who was jailed because he removed all the road signs to make them bilingual (Albanian-Greek) in adherence to a Council of Europe agreement. But given that Albania is not a signatory to this agreement and Mr Bolanos was prosecuted and convicted. This unfortunate choice of words by Mr Lambou that saw him entangled in an email spiral that ended up even with actual threats. The first to send a fiery response to Mr Lambou was the Secretary of the Panepirotic Federation of Australia and NKEE contributor Dean Kalymniou. According to sources in SAE and SAE Youth that were involved in this saga there were “personal motivations and animosities” behind these events. SAE was forced to step in on Wednesday and mediate in a meeting between Mr. Lambou and Mr Kalymniou. Although tensions ran high at some point of the meeting, it was agreed from both sides to consider the matter closed. When contacted by NKEE, Mr Lambou declined to make any comments. Accordingly, Mr Kalymniou did not wish to comment and sufficed to point out that the two parties had a meeting last week when “the issue was resolved”. SAE’s Victorian representative Dimitris Kanelakos also avoided making any official statements but highlighted that the SAE Youth of Victoria would hold a meeting on Sunday May 17. At the time of writing the meeting had not taken place.